The other night we were watching Castle, and in the show he was signing books – the book was then advertised in a commercial right at the end of the episode! That same night I was playing ‘Stand O’Food 3’ and there was a poster in the office for ‘Supermarket Mania 2’. Neither was obvious or over the top – certainly nothing like the previous evening when we saw a bit of General Hospital with a woman making chocolate milk for a young boy, but saying things like ‘wouldn’t you like some HERSHEY’s chocolate milk? I know when I’m sad nothing cheers me up like HERSHEY’s chocolate milk. When I was your age my mom used to make HERSHEY’s chocolate milk for me all the time’. And so on. It occurred to me that rather than being blatant merchandising, marketers are moving to more subtle inclusions to influence our choices. It also reminded me of a couple of things I saw on Consumerist this summer. 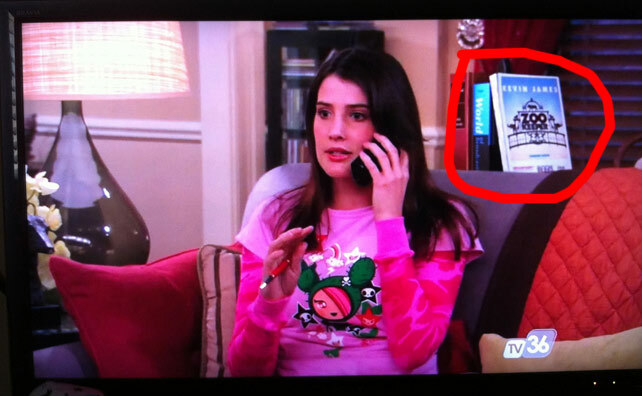 The first one – pictured above – shows a rerun of a 2007 episode of How I Met Your Mother with a magazine in the background with an advertisement for the summer 2011 film Zookeeper prominently displayed. 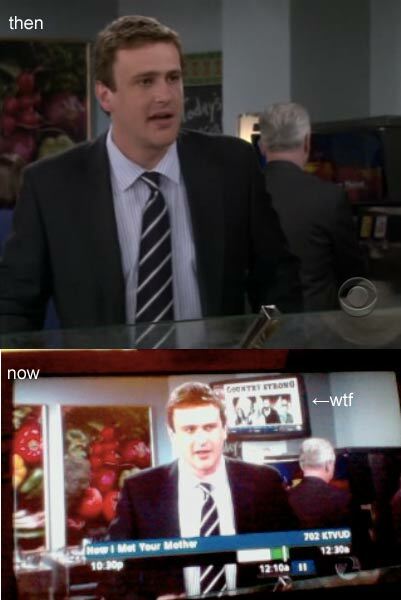 Again, a How I Met Your Mother rerun had an advertisement for a lousy movie digitally inserted – this time on a fake TV rather than a fake magazine. This is nothing new – USA Today has an article from nearly a decade ago about digitally inserted ads in sports – things like ‘on field’ logos and the like that are only seen on TV screens. But for me, it is different – in Sports it is ALL about sponsorship, down to shirts and ‘official socks’ and so on. On a TV show we watch their commercials and we get our 22 minutes of content per half-hour. Product placement has been there for years – it is hard to watch a show without seeing a well placed product (we were watching Jurassic Park and playing ‘spot the product placement’ a few weeks back). It is always interesting seeing older product placement for things like Pan Am, Packard Bell, or even Silicon Graphics. Things that no longer exist but are a part of the legacy of the visual product. But now even that barrier is gone – even within those 22 minutes product placement is now fluid, it is possible to alter the visual imagery to insert NEW product placements. Are we going to see Dell instead of Silicon Graphics on the Jurassic Park computers in reruns? What comes next – big Nike swooshes on the BayWatch swimsuit reruns? What do you think about the trend of digitally altering older TV shows and movies to add new placements? And do you think you would even be surprised if Obi-Wan had to replace the EverReady cells in his lightsaber in Star Wars Episode I as the bunny trucked across the screen and Jar Jar said ‘hoosa be yoosa’?